Arguably Britain’s greatest choral composer of the late twentieth century, Sir John Tavener’s music is performed in churches and cathedrals throughout the land and at the most important state occasions. This glorious recording from the choir of St George’s Chapel, Windsor Castle, includes The Lamb, perhaps one of the best-known choral works of the age. An essential part of the Orthodox Church is its special respect for tradition. It is seen as a living, creative force rather than as something dead or inhibiting. Thus it is that there is so great an appreciation of the early Fathers, seen as inheritors and continuers of the tradition of Scripture; thus it is that the techniques of ikon painting today are essentially what they were in the earliest examples; thus it is that the music of the Church has largely remained within the spirit of the early chant traditions. John Tavener’s music since he became a member of the Orthodox Church in 1977 has been increasingly orientated towards this notion of tradition. He has attempted to discard the heritage of humanist art (homocentric in origin and aim) and to absorb the precepts of the liturgical music of Orthodox tradition—that is to say, music which is theocentric. In practical terms this has meant that Tavener’s music has drawn upon actual chant, or has otherwise availed itself of the characteristics of chant both Russian and Byzantine. It could, nevertheless, not have been written at any other time than the late twentieth century: it is at once rooted in the depths of time and startlingly contemporary. The Uncreated Eros (1988) presents us immediately with a Byzantine drone (ison) and a single, chant-like melodic line, and the canonic choral treatment of the melody later in the piece only serves to emphasize the chromatic inflections characteristic of the Greek chant repertoire. The title of the piece requires some explanation: the text deals with the creation of Eve from Adam’s rib as recounted in Genesis. ‘It is an attempt in musical notes’, Tavener has written, ‘to recreate our Paradisial nature.’ ‘Uncreated Eros’ represents the uncreated love of God, love in its fullness: it is beyond mortal love in the same way that the uncreated light of God, present at the transfiguration of Christ, and experienced since by some saints and very holy men, is beyond the light of the sun. The radiant colours and ethereal textures of the music (deliberately recorded from a considerable distance) try to present this idea in physical sound. Utterly different in one sense are the Magnificat and Nunc dimittis ‘Collegium Regale‘, written in 1986 for King’s College, Cambridge. These are, by contrast, straightforward settings for use in the Anglican liturgy, but they are certainly among the most unusual pieces in that repertoire. They employ, like The Uncreated Eros, a melody with a drone in the Greek style. In addition, the Magnificat retains the troparion to the Mother of God of Orthodox usage, which is inserted after each verse of the text. The melody of the Magnificat is sung with different scorings of increasing richness for each verse, with a jubilant refrain for the troparion. The Nunc dimittis is a simpler, less elaborate piece melodically, but enjoys the same wealth of choral colour. King’s College was also the choir to make famous The Lamb (1985), through its inclusion in their annual Service of Nine Lessons and Carols. This carol is a gentle, lyrical setting of Blake’s famous poem, based on a simple melodic idea and its inversion. The Hymn to the Mother of God and Hymn for the Dormition, both written in 1985, form a pair. The first sets a text taken from the Liturgy of St Basil, sung on the feast of St Basil and on all the Sundays of Great Lent. It speaks of the cosmic power of the Mother of God, in whom ‘all creation rejoices’. 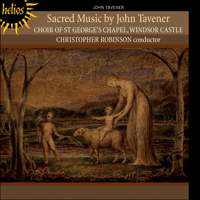 Tavener sets it as a brief but extremely intense canon between two choirs, in three sections: the incandescent music of the first is repeated after the central section which hails the Mother of God as ‘sanctified temple, mystical paradise’. The second Hymn uses a text for the Feast of the Dormition (that is, falling asleep) of the Mother of God: she asks the apostles to bury her body in Gethsemane, and Christ to receive her spirit. The text is simply repeated three times, the scoring being varied: the first time simply has the chant sung over a three-part drone; the second has it sung in fifths and with its inversion; and the third has a rich parallel-chord harmonization. Very different in character are the Christmas pieces Today the Virgin (1989) and God is with us. The former takes its inspiration from the Medieval folk-carol, with a suitable text by Mother Thekla (Abbess at Normanby) and has an infectiously memorable refrain with an increasing Alleluia. The latter is described as a ‘Christmas proclamation’, and was completed in 1987 for Martin Neary and the Choir of Winchester Cathedral. The text is adapted from the Orthodox service of Great Compline, which is sung on Christmas Eve; its basis is biblical. Beginning in tranquillity, the piece is in fact a radiant and joyful celebration. Much use is made of a solo tenor who sings a haunting melody, Byzantine in inspiration, while the choir sings cascades of notes around him. The shock comes in the final section with the introduction of the organ at the words ‘Christ is born!’, when the music is disconcertingly freed from harmonic weight. Saint Andrew of Crete was born late in the seventh century. His Great Canon, one of the most remarkable spiritual texts of Orthodoxy and one of the most extraordinary poetic achievements of Greek literature, is appointed to be read in its entirety at the morning service of Thursday in the fifth week of Great Lent. Tavener sets only the first Ode of the Canon (a complex liturgical form in the Orthodox Rite), from which the length of the whole may be gauged. The composer has said that the music (written in 1981) was prompted by his feelings of penitence during Lent, which in the Orthodox Church is very austere. The piece is in essence a very slow chromatic descent—a musical prostration. It begins and ends with an irmos. In between are twenty-three troparia (elements, like the irmos, of hymnography proper to the Canon) sung by a single male voice. The choir responds to each troparion alternatively in English, Greek, and Slavonic, with the phrase ‘Have mercy upon me, O God, have mercy upon me’. Love bade me welcome is an evocative setting, dating from 1985, of the poem by George Herbert. It evokes Bulgarian chant in its rich melodic line accompanied by an ison, and the simple harmonized repertoire of the Russian Church in the chord sequences at the ends of the three sections; but in its sensitivity and reticence (a reticence which in the end only intensifies the conveying of the words) it is unquestionably English. So too is The Tiger (1987), a companion piece to The Lamb. The music nevertheless responds to Blake’s images in a more obvious way than that of The Lamb: it has a pulsing, surging energy appropriate to the tiger, and a dazzling range of colour. Particularly splendid is the music for ‘When the stars threw down their spears’, which is followed immediately by a masterly musical reminiscence of The Lamb at ‘Did he who made the Lamb make thee?’. Eonia (1989) is a valedictory tribute to the painter, the late Cecil Collins. Tavener writes that he opened the collected works of the Greek poet Seferis and found the haiku ‘To Yiasemi’ (‘The Jasmine’) while talking on the telephone to Mother Thekla. He read it out and she continued in English and Slavonic—‘it was almost like “dictated” writing’, the composer has said. The music is of extreme delicacy and transparent simplicity, like the text. Tavener asks for it to be sung ‘with unearthly stillness and purity; with no “expression”’. In this it is, like much else in Tavener’s work, as spiritually transparent as an ikon. Une partie essentielle de l’Église Orthodoxe est le respect tout spécial qu’elle a pour la tradition. Elle ne la considère pas comme quelque chose de mort ou de restrictif, mais au contraire comme une force vivante et créatrice. C’est pour cette raison qu’elle a une telle appréciation des Pères de l’Église, considérés comme les héritiers et les gardiens de la tradition des Écritures; c’est ainsi que les techniques de peinture des icônes n’ont pratiquement pas changé depuis les premiers exemples que nous en avons; c’est ainsi que la musique de l’Église est demeurée largement dans l’esprit des traditions des premières psalmodies. La musique de John Tavener, depuis qu’il est devenu membre de l’Église Orthodoxe, en 1977, s’est de plus en plus orientée vers cette notion de tradition. Il a tenté de se débarrasser de l’héritage de l’art humaniste (qui est, d’origine et de but, centré sur l’homme) et d’absorber les préceptes de la musique liturgique de la tradition Orthodoxe—c’est-à-dire une musique qui est théocentrique. Cela veut dire, en termes pratiques, que la musique de Tavener a fait appel à la psalmodie réelle ou bien qu’elle s’est servie des caractéristiques de psalmodies russes et byzantines. Il faut cependant bien remarquer que cette musique ne pourrait être le produit que de la fin du vingtième siècle: bien que ses sources remontent au plus profond des temps, son caractère contemporain est aussi des plus saisissants. The Uncreated Eros («L’Éros incréé»; 1988) nous présente dès l’abord un bourdon byzantin (ison) et une ligne mélodique unique, psalmodique, et le traitement choral en canon de la mélodie plus loin dans le morceau ne sert qu’à souligner les inflexions chromatiques caractéristiques du répertoire grec de psalmodies. Le titre du morceau mérite quelque explication: le texte traite de la création d’Ève à partir de la côte d’Adam telle qu’on la trouve dans la Genèse. «C’est une tentative de recréer notre nature ‘paradisielle’», a écrit Tavener, «en notes musicales». Le «Uncreated Eros» représente l’amour de Dieu incréé, l’amour dans toute son ampleur: il est au-delà de l’amour mortel de la même façon que la lumière incréée de Dieu présente dans la transfiguration du Christ et dont quelques saints ont fait l’expérience. Les couleurs radieuses et les textures éthérées de la musique (que l’on a enregistrée à dessein à une considérable distance) tentent de traduire cette idée en sons physiques. Dans un certain sens, le Magnificat et le Nunc dimittis «Collegium Regale» écrits en 1986 pour King’s College, Cambridge, sont totalement différents. Par contraste, ce sont des mises en musique directes à l’usage de la liturgie anglicane, mais elles comptent certainement parmi les morceaux les plus insolites de ce répertoire. Elles utilisent, comme The Uncreated Eros, une mélodie avec un bourdon dans le style grec. De plus, le Magnificat garde le «troparion» adressé à la Mère de Dieu de la liturgie orthodoxe, qui est inséré après chaque strophe du texte. La mélodie du Magnificat se chante avec différentes notations d’une richesse croissante pour chaque strophe, avec un refrain radieux pour le «troparion». Le Nunc dimittis est un morceau plus simple, moins complexe, mais jouit de la même richesse de couleur chorale. Le chœur de King’s College est celui qui devait aussi rendre célèbre The Lamb («L’Agneau»), lorsqu’ils l’inclurent dans leur Service annuel de Neuf Leçons et Chants de Noël. Ce chant de Noël est une mise en musique légère et lyrique du fameux poème de Blake, basé sur une simple idée mélodique et son inversion. Hymn to the Mother of God («Hymne à la Mère de Dieu») et Hymn for the Dormition («Hymne pour la Dormition») écrits tous deux en 1985, forment une paire. Le premier met en musique un texte de la Liturgie de Saint Basile, chanté pour la fête de Saint Basile et tous les dimanches du Grand Carême. Il parle de la puissance cosmique de la Mère de Dieu, dont «toute la création s’honore». La mise en musique de Tavener est un bref mais extrêmement intense canon entre deux chœurs, en trois sections: la musique incandescente de la première se répète après la section centrale qui salue la Mère de Dieu comme «temple sanctifié, paradis mystique». Le second Hymne utilise un texte pour la Fête de «Dormition» (c’est-à-dire l’endormissement) de la Mère de Dieu: elle demande aux apôtres d’enterrer son corps à Gethsemani, et au Christ de recevoir son âme. Le texte est simplement répété trois fois, avec une notation différente: la première fois, la psalmodie est simplement chantée au-dessus d’un bourdon en trois parties; la seconde, la psalmodie est chantée en quintes et avec son inversion; et dans la troisième, la psalmodie a une riche harmonisation d’accords parallèles. Les ouvrages pour Noël Today the Virgin («Aujourd’hui la Vierge»; 1989) et God is with us («Dieu est avec nous») sont de caractère très différent. Le premier tire son inspiration d’un chant de Noël populaire médiéval, pour lequel Mère Thekla (Abbesse à Normanby) a écrit un texte et dont le refrain avec un Alléluia croissant est mémorable et communicatif. Le second, décrit comme une «Proclamation de Noël» fut terminé en 1987 pour Martin Neary et le Chœur de la Cathédrale de Winchester. Le texte est adapté du service orthodoxe de Grandes Complies, qui se chante la veille de Noël; il se base sur la Bible. Le morceau commence dans la tranquillité mais il est, en fait, une célébration joyeuse et radieuse. Une partie importante est donnée à un ténor solo qui chante une mélodie obsédante d’inspiration byzantine, tandis que le chœur chante autour de lui des cascades de notes. Le choc vient dans la section finale avec l’introduction de l’orgue avec les mots «Christ est né!», quand la musique se libère de façon déconcertante de son poids harmonique. Saint André de Crète naquit vers la fin du septième siècle. Son Grand Canon, l’un des textes spirituels les plus remarquables de l’Orthodoxie et une des réussites poétiques les plus extraordinaires de la littérature grecque doit être lu en entier durant le service matinal du jeudi, dans la cinquième semaine du Grand Carême. Tavener n’a mis en musique que la première Ode du Canon, mais cela nous permet de juger de la longueur du texte en entier. Le compositeur dit que la musique (écrite en 1981) lui fut suggérée par les sentiments de pénitence durant le Carême. Le morceau est en essence une descente chromatique très lente—une prostration musicale. Il commence et se termine par un «irmos». Entre eux se trouvent vingt-trois «troparia» (éléments, comme les «irmos» d’hymnographie propres au Canon) chantés par une seule voix d’homme. Le chœur répond à chaque «troparion» avec la phrase «Ayez pitié de moi, mon Dieu, ayez pitié de moi», alternativement en anglais, grec et slave. Love bade me welcome («L’Amour me souhaita la bienvenue») est une mise en musique évocatrice, de 1985, du poème de George Herbert. Il rappelle le chant bulgare, avec sa riche ligne mélodique accompagnée d’un «ison», et le simple répertoire de l’Église russe avec les séquences d’accords à la fin des trois sections; mais dans sa réticence et sa sensibilité, il est indubitablement anglais. Il en est de même pour The Tiger («Le Tigre»; 1987), compagnon de «L’Agneau». La musique correspond cependant aux images de Blake bien plus visiblement que dans «L’Agneau»: elle a une énergie palpitante et croissante qui convient au tigre, et une gamme éblouissante de couleurs. La musique de «Quand les étoiles jetèrent leurs lances» est particulièrement splendide, et elle est suivie immédiatement par une réminiscence musicale magistrale de «L’Agneau» avec «Te créa-t-il, celui qui créa l’Agneau?». Eonia (1989) est un hommage d’adieu au peintre Cecil Collins, décédé. Tavener écrivit qu’il avait ouvert le recueil des œuvres du poète grec Seferis et avait trouvé le haiku «To Yiasemi» («Le Jasmin») au cours d’une conversation téléphonique avec Mère Thekla. Il le lui lut à haute voix et elle continua en anglais et en slave—«c’était presque comme une écriture ‘dictée’, expliquait-il». La musique est d’une délicatesse extrême et d’une simplicité transparente, comme le texte. Tavener demande qu’il soit chanté «avec une pureté et une tranquillité surnaturelle: ‘sans expression’». À cet égard, cette musique est comme beaucoup d’autres ouvrages de Tavener, aussi transparente qu’une icône. Ein wesentliches Merkmal der orthodoxen Kirche ist ihre besondere Hochachtung für Tradition. Sie wird nicht als etwas Abgestorbenes oder Beschränkendes, sondern als lebendige, kreative Kraft gesehen. Daher kommt es, daß die Kirchenväter eine derart bedeutende Stellung einnehmen, denn sie werden als Erben und Fortsetzer der biblischen Tradition angesehen; daher kommt es, daß sich die Techniken der Ikonenmalerei heute noch an den frühesten Beispielen der Gattung orientieren; daher kommt es, daß die Musik der Kirche weitgehend im Geist der frühen Gesangstraditionen fortgeführt wird. Seit er 1977 der orthodoxen Kirche beitrat, hat sich John Taveners Musik zunehmend an diesem Verhältnis zur Tradition orientiert. Er hat sich bemüht, das Erbe humanistischer Kunst abzulegen, die von ihren Ursprüngen und ihrer Zielsetzung her homozentrisch ist, und sich die Lehren der liturgischen Musik orthodoxer Tradition anzueignen—d.h. einer theozentrischen Musik. In der Praxis hat sich daraus ergeben, daß Taveners Musik sich auf existierende Gesänge bezieht oder die Besonderheiten russischer und byzantinischer Kirchenmusik anderweitig nutzt. Dennoch könnten diese Werke zu keiner anderen Zeit als dem ausgehenden 20. Jahrhundert entstanden sein: Sie sind zugleich tief in der Vergangenheit verwurzelt und erstaunlich modern. The Uncreated Eros (1988) präsentiert uns gleich zu Anfang einen byzantinischen Bordun (ison) und eine einstimmige Melodielinie, und die spätere chorische Umsetzung der Melodie in einem Kanon ist lediglich geeignet, die für den griechischen Kirchengesang typischen chromatischen Modulationen zu betonen. Der Titel des Stücks bedarf einer Erklärung: Der Text handelt von der Erschaffung Evas aus Adams Rippe, wie sie im ersten Buch Mose geschildert wird. „Es ist dies ein Versuch in musikalischen Noten“, schreibt Tavener, „unser paradiesisches Wesen nachzuvollziehen“. Der „unerschaffene Eros“ verkörpert die unerschaffene, ewige Liebe Gottes, Liebe in ihrer ganzen Fülle; sie übersteigt alle sterbliche Liebe ebenso, wie das ewige Licht Gottes, das bei der Verklärung Christi zugegen war und seither von manchen Heiligen und besonders gottgefälligen Menschen wahrgenommen wurde, das Licht der Sonne übersteigt. Die strahlenden Farben und ätherischen Strukturen der Musik (bewußt aus einigem Abstand aufgenommen) versuchen diese Idee in konkreten Klang umzusetzen. In gewisser Hinsicht völlig anders sind das Magnificat und das Nunc dimittis „Collegium Regale“, die 1986 für das King’s College, Cambridge, entstanden. Hier handelt es sich um ganz normale Vertonungen für die anglikanische Liturgie, doch gehören sie zweifellos zu den ungewöhnlichsten Stücken dieses Repertoires. Sie bedienen sich wie The Uncreated Eros einer Melodie mit einem Bordun im griechischen Stil. Daneben behält das Magnificat das Troparion auf die Mutter Gottes aus dem orthodoxen Usus bei, das nach jedem Textvers eingeschoben wird. Die Melodie des Magnificat wird von Vers zu Vers in unterschiedlicher Besetzung von zunehmender Üppigkeit gesungen, mit einem frohlockenden Refrain für das Troparion. Das Nunc dimittis ist melodisch schlichter und weniger aufwendig, erfreut sich jedoch der gleichen Vielfalt an Chorklängen. Der Chor der King’s College war es auch, der The Lamb bekannt machte, indem er das Werk in seinen alljährlichen Gottesdienst der neun Lektionen und Carols aufnahm. Dieser Carol ist eine sanfte, lyrische Vertonung von Blakes berühmten Gedicht, die auf einer schlichten Melodie und deren Inversion beruht. Die Hymn to the Mother of God und Hymn for the Dormition, beide 1985 entstanden, bilden ein Paar. Die erste der beiden Hymnen ist die Vertonung eines Textes aus der Sankt-Basilius-Liturgie, zu singen am Festtag des heiligen Basilius und an allen Fastensonntagen. Sie kündet von der kosmischen Macht der Mutter Gottes, in der „alle Schöpfung frohlocket“. Tavener setzt den Text als kurzen, aber höchst intensiven Kanon für zwei Chöre in drei Abschnitten um: Die innige Musik des ersten Teils wird nach dem Mittelteil wiederholt, in dem die Mutter Gottes als „geheiligter Tempel, mystisches Paradies“ gegrüßt wird. Die zweite Hymne verwendet einen Text zum Fest des Entschlafens der Mutter Gottes: Sie bittet die Apostel, ihren Leichnam in Gethsemane zu begraben, und Christus, ihre Seele aufzunehmen. Der Text wird einfach dreimal wiederholt, zu unterschiedlicher Musik: Beim ersten Mal ertönt der Gesang über einem dreistimmigen Bordun; beim zweiten Mal wird er in Quinten und mit Inversion gesungen; der dritte Durchgang ist üppig mit parallel geführten Akkorden harmonisiert. Gänzlich anders gestaltet sind die Weihnachtsstücke Today the Virgin (1989) und God is with us. Das erstere ist von einem mittelalterlichen Weihnachtsvolkslied inspiriert, mit einem passenden Text von Mutter Thekla (der Äbtissin von Normanby) und einem mitreißend eingängigen Refrain mit zunehmendem Alleluja. Das zweite Stück trägt die Bezeichnung „Weihnachtsproklamation“ und wurde 1987 für Martin Neary und den Chor der Winchester Cathedral vollendet. Der Text ist dem orthodoxen Gottesdienst des großen Kompletoriums entlehnt, der am Heiligabend begangen wird; er beruht auf einem Bibeltext. Das Stück beginnt zwar ruhig, entfaltet sich jedoch zu strahlender, freudiger Feierlichkeit. Der Solotenor kommt ausgiebig zum Einsatz mit einer byzantisch inspirierten, betörenden Melodie, während der Chor ihn mit Notenkaskaden umgibt. Der Schock erfolgt im Schlußteil, wenn bei den Worten „Christ ist geboren!“ die Orgel einsetzt und die Musik auf beunruhigende Weise von harmonischem Ballast befreit wird. Der heilige Andreas von Kreta wurde in der zweiten Hälfte des 7. Jahrhunderts geboren. Sein Großer Kanon, einer der bedeutsamsten geistlichen Texte der orthodoxen Kirche und eine der großartigsten poetischen Leistungen der griechischen Literatur, ist dazu bestimmt, beim Morgengottesdienst am Donnerstag der fünften Fastenwoche in voller Länge verlesen zu werden. Tavener vertont nur die 1. Ode des Kanons (einer komplexen liturgischen Form des orthodoxen Ritus), aus der sich der Umfang des Gesamtwerks ersehen läßt. Der Komponist sagt dazu, die (1981 entstandene) Musik sei von seinen Gefühlen der Bußfertigkeit zur Fastenzeit bestimmt, die in der orthodoxen Kirche streng eingehalten wird. Das Stück ist im Grunde ein einziger, äußerst langsamer chromatischer Abstieg—eine musikalische Prostration. Es beginnt und endet mit einem irmos. Dazwischen finden sich 23 Troparien (wie beim irmos handelt es sich hierbei um dem Kanon eigene hymnographische Elemente), gesungen von einer einzelnen Männerstimme. Der Chor antwortet auf jedes Troparion, abwechselnd auf Englisch, Griechisch und Slawisch, mit der Phrase „Erbarme Dich meiner, O Gott, erbarme Dich meiner“. Love bade me welcome ist die 1985 entstandene, beziehungsreiche Vertonung eines Gedichts von George Herbert. Mit ihrer üppigen Melodielinie, begleitet von einem ison, beschwört sie bulgarische Gesänge herauf, und mit den Akkordsequenzen jeweils am Ende der drei Abschnitte das schlicht harmonisierte Repertoire der russischen Kirche. Dagegen ist das Stück in seiner Sensibilität und Zurückhaltung (die schließlich die Bedeutung der Worte nur verstärkt) ganz und gar englisch. Das gleiche gilt für The Tiger (1987), das Gegenstück zu The Lamb. Hier jedoch reagiert die Musik eindeutiger auf Blakes Bildelemente als bei The Lamb: Sie weist eine pulsierende, drängende Energie auf, die dem Tiger angemessen ist, sowie eine blendende Klangfülle. Besonders großartig ist die Musik zu „Als die Sterne geschleudert manchen Speer“, der unmittelbar eine meisterhafte musikalische Reminiszenz an The Lamb folgt, und zwar an der Stelle, wo es heisst: „Schuf der Schöpfer des Lammes auch dich?“. Eonia (1989) ist ein ehrender Nachruf an den verstorbenen Maler Cecil Collins. Tavener schreibt, er habe die gesammelten Werke des griechischen Dichters Seferis aufgeschlagen und Haiku „To Yiasemi“ („Der Jasmin“) gefunden, während er am Telefon mit Mutter Thekla sprach. Er habe es ihr vorgelesen, und sie habe es auf Englisch und Slawisch weitergeführt—„es war beinahe so etwas wie spiritistisches ‘Schreiben nach Diktat’“, sagt dazu der Komponist. Die Musik ist, dem Text entsprechend, von extremer Zartheit und transparenter Schlichtheit. Tavener gibt die Anweisung, das Stück solle „mit überirdischer Stille und Reinheit, ohne jeglichen ‘Ausdruck’“ gesungen werden. In dieser Hinsicht gleicht es, wie so vieles andere in Taveners Werk, der verinnerlichten Transparenz einer Ikone.